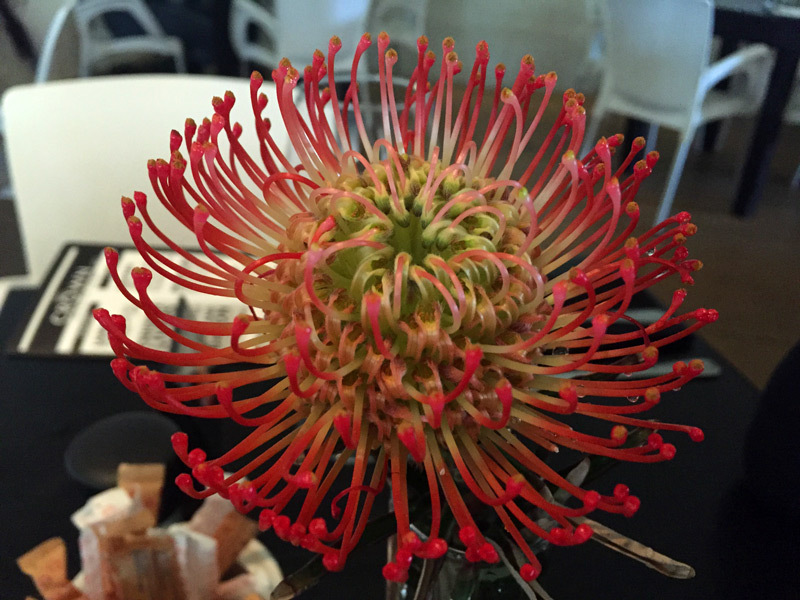 My girlfriend and I recently had the pleasure of visiting Crown restaurant at Meerendal Wine Estate along the Durbanville Wine Route. 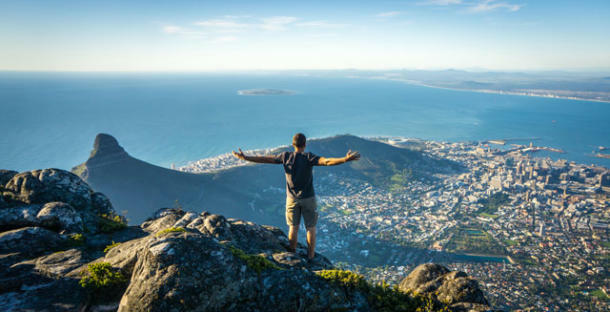 Being one-time residents of Durbanville, we thought we’d support one of the local farms and start discovering the local wine route as opposed to the Winelands which is quite a distance away from where we stay. We booked our table online and the process was smooth enough and we got confirmation via SMS and email with a follow-up confirmation. Upon our arrival, we were directed straight to our table. The waiters were a bit flustered as we had multiple waiters faffing around without being too sure which were our exact waiter. We settled in nicely and decided to order a bottle of wine. 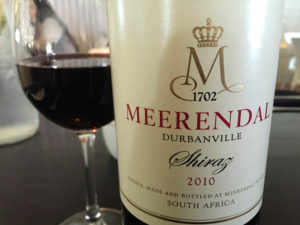 My love for the bolder wines (Cab, Pinotage or Shiraz) were especially satisfied with the Meerendal Shiraz 2010. So much so that I later bought a box (@ R165 a bottle). It’s peculiar that the cellar price is the same as the restaurant price. This can, however, be argued both ways (maybe restaurant guests are paying cellar prices instead of ‘restaurant prices’). We ordered some food and started admiring the space. There is a large fireplace which makes this perfect for a winter visit. The ‘barn’ feel is carried through to the rough walls and roof, yet it’s clean inside. 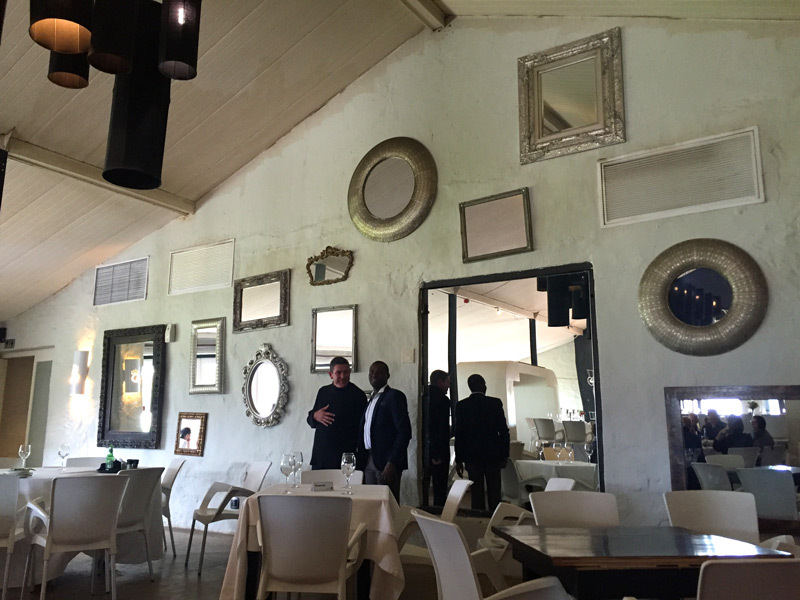 We both liked the mirrored wall at the back of the restaurant. It’s a nice feature alongside the stylish lights hanging from the roof. 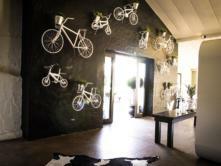 There is also a wall of bicycles on the entrance side of the restaurant that’s a lovely unique touch. 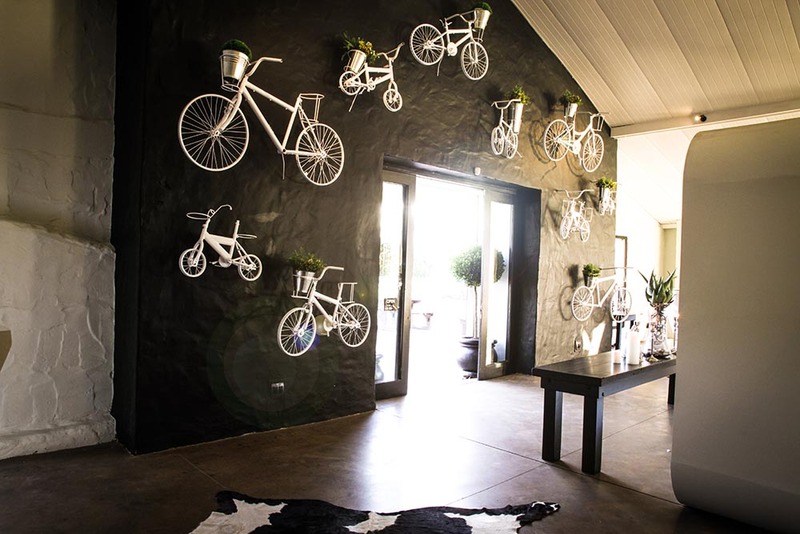 In fact, Meerendal is very popular for MTB around the farm and riders often frequent the restaurants (there is a Carlucci’s Deli) afterwards. Soft jazz music was playing from hidden speakers and created a nice ambience in the space. There were quite a few large booked tables (it seems birthday parties and other family get-togethers seem to love this space) and the noise levels rose at times, but the music balanced it out nicely. I ordered a burger and my girlfriend ordered the Carbonara. Both meals looked great and I can highly recommend the burger. We got out food within 15 minutes of ordering and the restaurant was quite busy, so no complaints on timing. 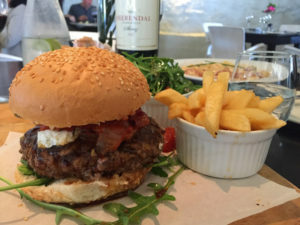 The bacon & cheese burger was served with a lovely home-made beef patty, tomato & onion relish, soft blue cheese (if I recall correctly) and tasty sides of salad & chips. It will fill the hungriest of guests. I had a quick taste of the pasta and it was lovely too. I had a quick taste of the pasta and it was lovely too, so we can recommend that. I think I liked the burger better, but it depends on what you feel like on the day. 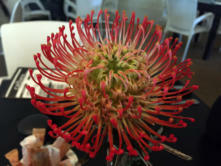 Ultimately we had a good time and can highly recommend Crown Restaurant’s food and of course Meerendal wine. For more information, visit their website on www.crownrestaurant.co.za.